Comixology is indeed a game changer. 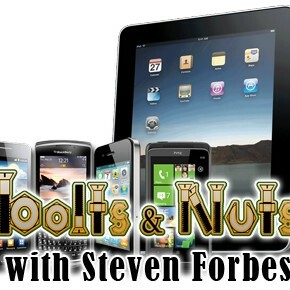 Unfortunately, true digital sales numbers are shrouded in a lot of mystery. There is no public Comixology sales charts with real sales numbers published regularly. So, I’ll be drawing on anecdotal evidence and my own experience here. But the picture that is emerging is that Comixology and digital sales are starting to have a real impact on creators’ bottom lines. 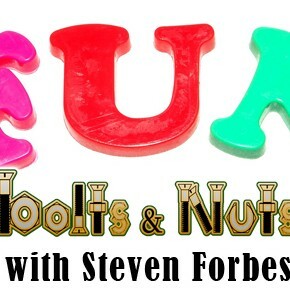 Jim Zub has been posting a series of informative posts on the economic reality of publishing his creator-owned Image Comics series Skullkickers on his blog over the past few years. Jim’s articles are must read stuff, and most read like a dousing of the cold water of reality of independent comic publishing. Sorry creators, having a well-received series at Image doesn’t mean you get to quit your day job and roll around in the Benjamins, as Jim is quick to point out. But even for someone like me, who knows the numbers of comics publishing quite well, the thought that Skullkickers could have made it some three trades worth of issues and an over-sized hardcover collection and still not have made any profit for Jim is a kick in the gut. Or at least it was, until Zub’s most recent post, where he was able to report that Skullkickers is now a profitable endeavor for him, and and is on track to remain so over the course of the rest of its run. Digital sales for the Skullkickers series are turning out to be a great stabilizer, which mitigates the cost and risk of printing more issues. Early issues continue to sell, long after those books have been off the retail shelves. And it’s also eye-opening to see that Skullkickers digital trade collections are selling very well, too. And Jim Zub is not alone. While prior to this year, I was hearing a whole lot of silence from creators about the size of their digital sales, I’m seeing more and more creators, especially those with a decent sized backlist, start speaking positively about their digital revenues. Quick aside: I’m am insanely jealous of Monkeybrain Comics‘ business model, for a number of reasons. 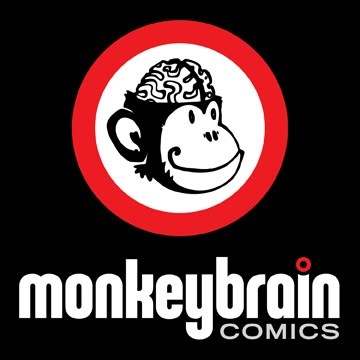 First, you have to love its focus…as far as I can tell, Monkeybrain is focused directly on just one platform, Comixology. Second, how can you not love a business model that has ZERO overhead? Seriously, they boast a library of 42 titles, all of which are permanently available, at an overhead cost of zero. 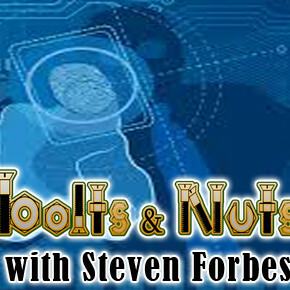 On months where I’m stressing out over making sure that the funds coming in to keep the Comixtribe machine running are at least as high as the dollars going out, I definitely tip my hat to the Monkeybrain team. It’s clear that both creators and publishers are using the Comixology platform to launch and build interest and an audience for titles in a low risk, low capital expenditure way, and then parlaying that into a print/retail strategy. What remains to be seen is just how well these digital first titles do in the direct market…but you can bet I’ll be paying attention. 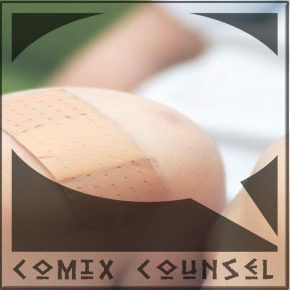 It’s been seven months now that ComixTribe has been distributing digital books through the Comixology platform. While that’s still a relatively short time to make sweeping statements, I now have three quarterly sales reports to pour over. So, let’s dive in, shall we? Now, given the fact that these books represent the creator-owned work of multiple people, I’m not going to reveal actual numbers (they are currently in the three digit territory.) Instead, I want to focus on comparative stats, and trends and observations. 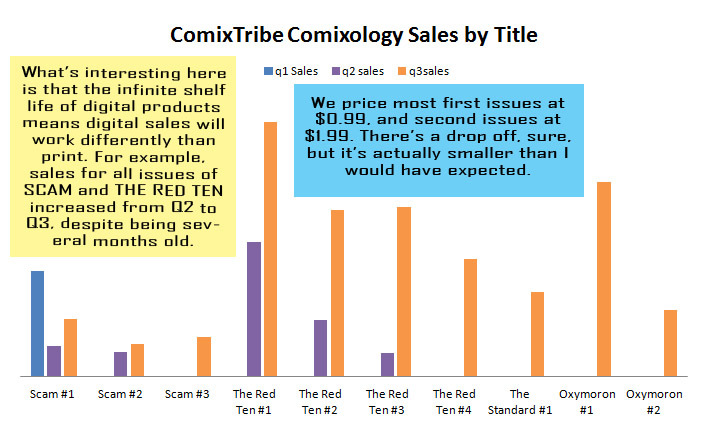 Above is a chart showing relative # of sales of all of the ComixTribe comics that were on sale on Comixology through September 2013. There are a number of exciting things from a publisher’s perspective about the trend-lines of our Comixology sales. Our # of sales per title available has increased each quarter, which suggests that the more books a creator or publisher releases on the Comixology platform, the better each book will sell. This has actually been the experience of many e-book publishers on the Kindle platform, who’ve found the absolute best marketing for their older e-books, is to release more new e-books! Because that backlist never goes out of print, seeing a cool cover for a later issue may send interested new readers right back to #1. 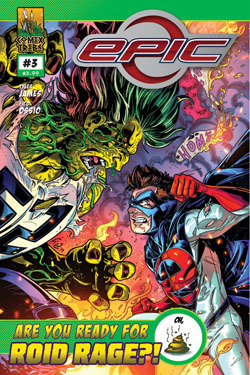 As a release strategy, ComixTribe released all #1 issues at the $0.99 price point, and not surprisingly, those issues tend to sell the best. But the drop off for the $1.99 issues from series to series so far is less than I would have expected. I think it’s clear that Comixology consumers still see the under $2 price point as a great deal for digital comics. We sold more copies of SCAM #1-2 and THE RED TEN #1 -3 in Q3 than we did in Q2, despite those books being older releases. This is a great example of the power and promise of the unlimited shelf-life of digital books. Inexplicably, THE RED TEN #3 has now sold more copies than THE RED TEN #2 both in print AND in digital. I’ve got a no-prize for ANYONE who can explain that one! Okay, so digital sales are growing. But hell, you can double sales 5xs over and it not mean anything if your sales start low enough. 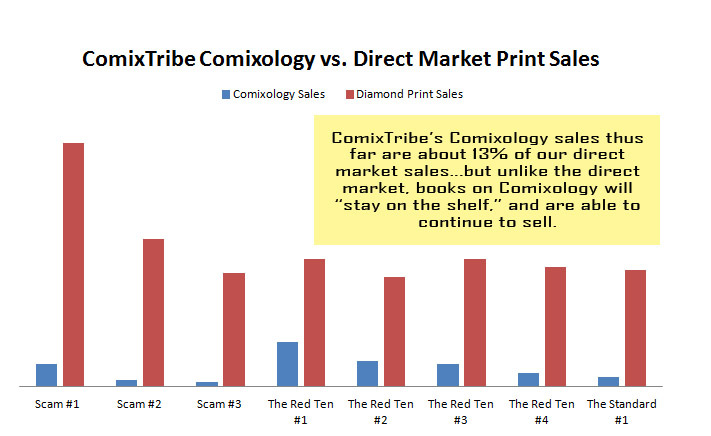 So, how are these Comixology sales comparing to our direct market print sales? I’m glad you asked! 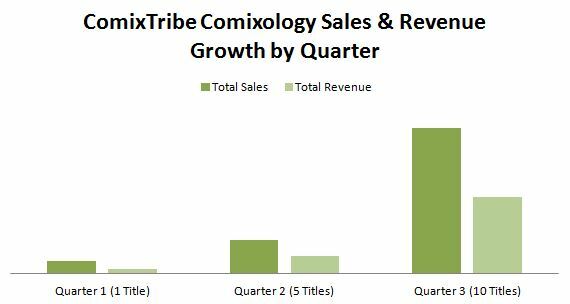 It was interesting to see that for ComixTribe, Comixology sales are, on average, about 13% compared to the size of ComixTribe’s direct market orders through Diamond. There are some outliers. 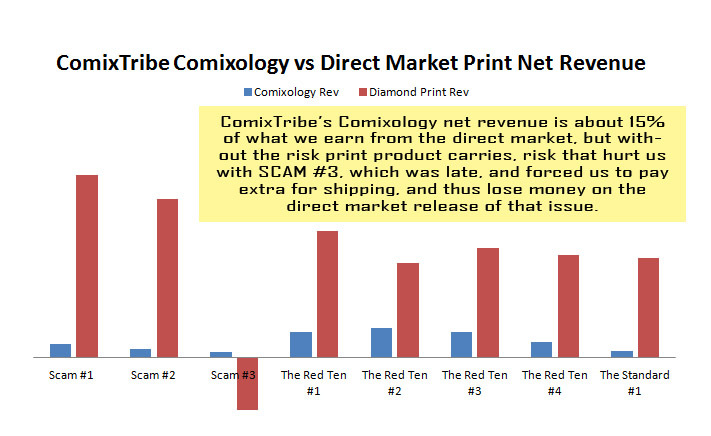 The SCAM series has had comparatively far greater buy in from the direct market than on Comixology, and THE RED TEN series has had a stronger digital adoption, with THE RED TEN series’ Comixology sales about 20% of the direct market orders, and growing. Interestingly, this puts us more or less in line with the experience of Image Comics, who have previously reported digital sales to be about 15% of print. So, while print still dwarfs digital in terms of total number of units sold, the biggest difference is that those print numbers…they’re capped. They’re never going to get any bigger. Whereas I fully expect the digital sales numbers to keep growing for us. And considering THE RED TEN series has another 6 issues to go, I would not be surprised if digital sales of early issues ultimately surpass print sales. But that’s sales. What about revenues? Let’s look! Digital distribution carries none of the risk that print does. Risk, that in reality will bite you every now and again. As you can see from the chart above, despite rather minuscule Comixology profits, SCAM #3 made us a lot more digitally than the print version, which lost us money. Now, that was a special case, where, because the book was late, we had to pay extra for rush shipping to make sure it got to Diamond before being canceled. It was an unforced error on our part, and as a result, we no longer solicit books that aren’t line-art complete as a company policy (lesson learned.) But exception or no, it illustrates the inherent risk attached to distributing atoms (print) vs. distributing bits (digital). With print comic sales in the direct market for small publishers, it’s essentially a one time payout. (Maybe two if you get a re-order.) 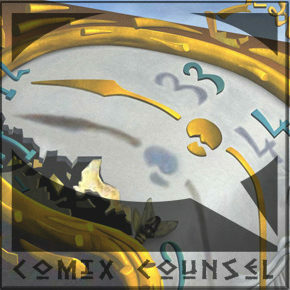 But with the long shelf-life of digital, ComixTribe backlist titles have the ability to keep selling, and contribute to an ongoing revenue stream that can do a lot to even out the cash flow issues that every publisher will inevitably face. 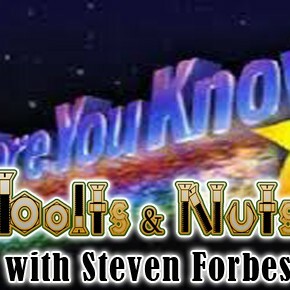 As I said, the above examples are simply anecdotal. But, the evidence is strong that Comixology is changing the game for creators of all stripes. And the fact that it’s doing this while direct market sales are as strong as they’ve been in years is great news for everyone. Digital comics have no collectiblity. 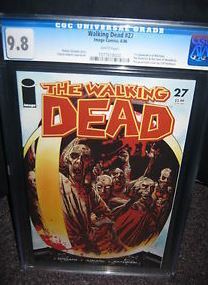 As Larry Doherty, of Larry’s Wonderful World of Comics likes to say, he will buy your first printings of early issues of The Walking Dead for hundreds of dollars, but sadly, can pay nothing for your digital copies. And Larry, a print retailer, has a great point. The collectibility of print comics is, and likely always will be, an important aspect of the industry. But an argument can be made that strong and growing digital sales is a far better indicator of the strength of the comics medium than print sales. After all, we know there are a ton of ways to “cook the books” on print sales numbers. With variant cover incentives, fully returnable promotions, and bigger retailers single-handedly bumping the numbers of books by thousands when ordering custom covers, it’s not so easy to get a true sense of the size of the comic market or audience of a particular book. We all know the affect of the speculator boom in the 90’s, where tons of books were bought and horded, “speculator collectors” thinking one thousand copies of The Death of Superman first printings were going to put their kids through school. And to a certain extent, with a month full of lenticular covers and 50 state variants from DC, and Marvel in a cycle of infinite reboots at #1, there are some worries that some of the speculator bubble tricks of the 90s are creeping back into the industry. Yes, direct market sales are up this year, and they were up last year too, but it’s hard to say how much of that is due to these collector’s bait type tricks. But in the 90s, we didn’t have digital comics to even things out. By and large digital sales are true sales, in the sense that they represent a genuine interest in the CONTENT of the book, with an intent to read it. Even the most die-hard of collectors knows that there is no chance their Comixology purchases are going to rise in value. So, all digital sales, presumably are because someone wants to READ the book. There is no speculator boosting for digital numbers, no digital variant covers (yet…let’s not ever make that happen, okay), which is one reason why we shouldn’t be shocked that digital numbers are still but a fraction of print. And rather than a few thousand retailers determining actual sales numbers (and in a sense, also determining the sales ceiling for every print title, as retailer orders are the single biggest determinant of print run sizes), each Comixology consumer gets a vote, and there is no ceiling on what a book can sell. So the fact that Comixology sales as a whole keep climbing (to the extent that we can tell that with what little data is made public) is a great sign for the comic medium as a whole. One question that often gets posed, and some retailers aren’t even clear on, is what does the profit per book look like print vs. digital? Note, the standard Diamond distribution deal is that books are sold to Diamond for 60% off the cover price. Note, the variable in the profit calculation is the per unit print cost, which depends entirely on print run size, which is determined primarily by Diamond Purchase order size. If ComixTribe could increase our sales per issue by a just a thousand or two, PPI could easily surpass $1.00. At a $0.99 price point, our PPI is $0.37. At a $1.99 price point, our PPI is $0.72. Note: The Comixology Submit deal is that publisher and Comixology split profits, after Apple fees (if applicable), currency exchange fees, and a whole host of other fees. The numbers above aren’t posted anywhere, rather, they’re the numbers I’m actually seeing come through in the form of real dollars into a real bank account. As you can see, for a publisher ComixTribe’s size, one that is still struggling to get buy-in and adoption from more than 10% of the direct market, we can sell our digital books at half the price of print and still net more money per issue than we do on our print books sold through Diamond. Now, this isn’t true for all publishers. Throw another zero on to our print run sizes, and print becomes a lot more profitable. But from a pure bottom line standpoint, a print sale isn’t worth more to a small publisher than a digital sale. This is clearly a pro-digital and pro-Comixology piece. But make no mistake about it, I’m certain that the fact that print versions of our titles exist have contributed to better digital sales, than if we were only selling through Comixology. Print + Digital will beat either by itself every single time. So, no, the promise of digital, and even the success of a publisher like Monkeybrain has not made me want to pull up the reigns on print, and go all in on digital. 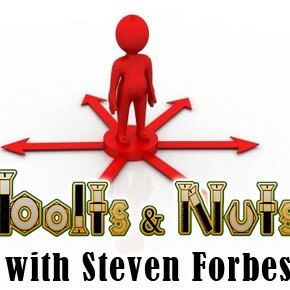 Rather, the success of digital, and the extension or the life cycle of our books that digital enables, will help support future outreach to the direct market, and help mitigate the risks there for us. 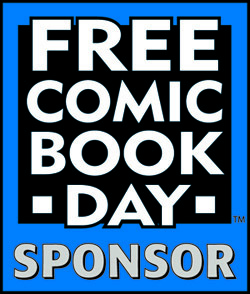 Have a question or want to share your Comixology experience? 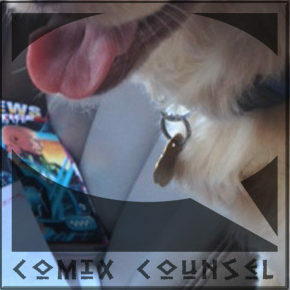 Please join me in the ComixTribe Forums at Digital Webbing! Who’s Going to Review My Independent Comic Book?